Sydney Inlet Provincial Park contains one of the finest examples of a fjord on Vancouver Island, and is a perfect wilderness area for sea kayaking and pleasure boating. Located in northern Clayoquot Sound on the west coast of Vancouver Island, the park protects old-growth Sitka spruce and Douglas fir forests, portions of the Sydney River and its estuary. This estuary supports four species of salmon, including a notable population of Chinook. A variety of rare and unusual flora and fauna can also be found in this undeveloped, pristine wilderness park. The park is situated in northern Clayoquot Sound between Hesquiat Lake and Pretty Girl Lake on the west coast of Vancouver Island. Sydney Inlet Park is accessible by float plane or boat. Boaters can reference marine chart #3674 for more information on this area. History - This area was identified for protection in the Clayoquot Sound Land-Use Decision in 1995. Cultural Heritage - This park contains Nuu-chah-nulth First Nation heritage sites. 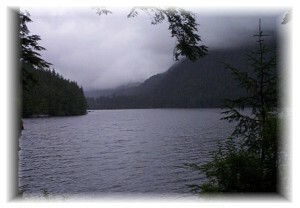 Conservation - Sydney Inlet is one of the best examples of a fjord on Vancouver Island. The Sydney River and its estuary support four species of salmon, including a notable population of Chinook. Old-growth Sitka spruce and Douglas fir forests are also protected within the park, as well as a variety of rare and unusual flora and fauna. Approved Purpose Statement and Zoning Plan [PDF] for Sydney Inlet Provincial Park is available online in pdf format. There are kayaking opportunities at this park. Canoeing is not recommended. The waters of Clayoquot Sound may contain a variety of fish species, including salmon, rockfish, halibut and lingcod. Fishing is permitted as per provincial and federal fishing regulations. All anglers should check the current regulations issued by Fisheries and Oceans Canada prior to fishing. Anyone fishing or angling in British Columbia must have an appropriate licence. Portions of this park are open to hunting for specific species. Hunters must have valid licences and tags. Please refer to current printed Hunting and Trapping Regulations and Synopsis publication for closures and regulations. There is no designated swimming area at this park however opportunities exist for ocean swimming. There are no lifeguards on duty at provincial parks. While small fires are allowed, we encourage visitors to conserve the environment by minimizing the use of fire and using stoves instead. If you do have a fire use small pieces of wood that will burn completely. Build your fires below the high tide mark. Never leave your fire unattended and practice “Leave No Trace” camping ethics. There are no designated campsites at this park, however random wilderness camping is allowed. No facilities are provided and there is no fee. Please practice “Leave No Trace” camping ethics. Sydney Inlet Park is accessible year-round; there is no winter backcountry camping fee.